The Guardian. Art and Design. "It's Important to Show Art that Reflects Different People" By Sayej, Nadja. July 5, 2018. Rod’s artwork "One Vision" was featured in the article. The piece highlights Rod's participation in the group exhibition at X Gallery and that Rod Sánchez’s painting “One Vision” is on display in New York City in a featured public space. The location is beside the bus stop on 116th Street & 5th Ave.
El País – Newspaper of Cali, Colombia. Feature Interview. “El Hombre que Pintó a la Selección.” By Zapata, Anderson. June 15, 2018. Print. Rod’s artwork and a full interview were featured on the front page of El País – the national newspaper of Cali, Colombia in South America. The feature cover story focuses on Rod’s paintings of the 2018 FIFA World Cup Colombia National Team created for the 2018 Tschutti Heftli Collectors Album. El País.com.co. Feature Interview. “Los 11 de la Selección como nunca los habías visto: así los retrataron en álbum alternativo.” By Zapata, Anderson. June 14, 2018. Rod’s artwork and a full interview were featured in El País. The online feature story focuses on Rod’s paintings of the 2018 FIFA World Cup Colombia National Team created for the 2018 Tschutti Heftli Collectors Album. SWR3 Radio. “When Football Collectors Become Art.” By Langer, Christine & Firnstein, Robin. May 24, 2018. Rod’s portrait artwork of Carlos Alberto Sánchez from the Colombia 2018 FIFA World Cup National Team, was featured in the article covering press news for the 2018 Tschutti Heftli Collectors Album. The Irish News.“These Alternative World Cup Stickers put the ‘Beautiful’ in the Beautiful Game.” By Press Association. Press Association. April 26, 2018. Express Star.“These Alternative World Cup Stickers put the “Beautiful” in the Beautiful Game.” By Press Association. The Bleacher Report.“Fellaini's a Tree and Messi's a Goat: The Alternative World Cup Sticker Album.” By Welch, Neil. 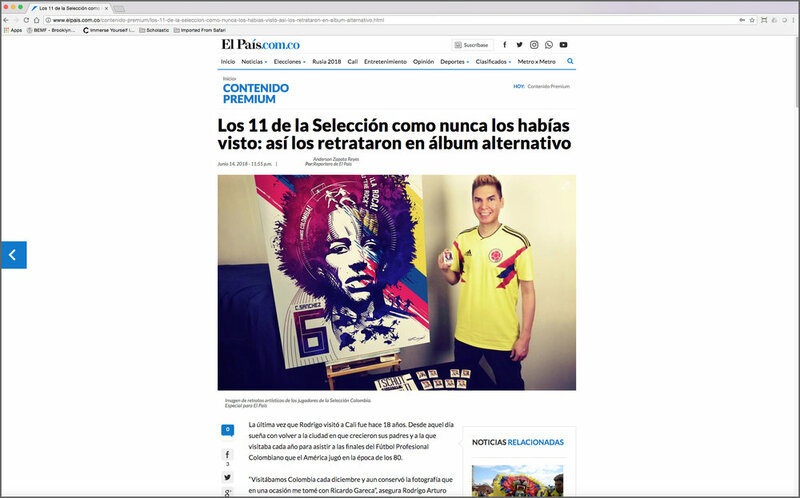 Rod’s portrait artwork of Radamel Falcao from the Colombia 2018 FIFA World Cup National Team, was featured in the article and embedded video promoting the 2018 Tschutti Heftli Collectors Album. Rod’s paintings of the Colombia National Team have been published in the Tschutti Heftli Collectors Album by Swiss fútbol magazine Tschutti Heftli. Rod’s painting of Carlos Sanchez is featured on the banner of the magazine’s site. The painted portraits include the following players in the Colombia 2018 FIFA National Team: James Rodriguez, Radamel Falcao, David Ospina, Juan Cuadrado, Carlos Sánchez, Frank Fabra, Santiago Arias, Abel Aguilar, Edwin Cardona, Davinson Sánchez, Cristián Zapata, & coach José Néstor Pérkerman. The Bund. “Gather More Beautiful.” April 4, 2017. Rod’s portrait artwork of Diego Maradona was featured in the article as a winner of the Tschutti Heftli International Illustration Competition hosted by Swiss magazine Tschutti Heftli. Rod Sanchez’s portrait artwork of Diego Maradona was published in the calendar as a winner of the Tschutti Heftli International Illustration Competition hosted by Swiss magazine Tschutti Heftli. Der Landbote. “Soon Revealed: The ‘Panama-Bildli.” November 28, 2017. Rod’s portrait artwork of Diego Maradona was featured in the Swiss-German-language daily newspaper article in Winterthur, Switzerland as a winner of the Tschutti Heftli International Illustration Competition hosted by Swiss magazine Tschutti Heftli. 20 Minutes News – Switzerland. “Tschutti Heftli Received 523 Maradonas: Who Can Draw one of 32 Teams of the World Cup for Tschutti Heftli?.” September 18, 2017. The Huffington Post. “Across the Divide: Healing the American Psyche.” By Sánchez, Raúl. June 5, 2017. Rod’s artwork, Spreading United Seeds of Mind, was featured in The Huffington Post article, “Across the Divide: Healing the American Psyche” written by Raúl Sánchez. Broadway World – New Jersey. BWW News Desk. 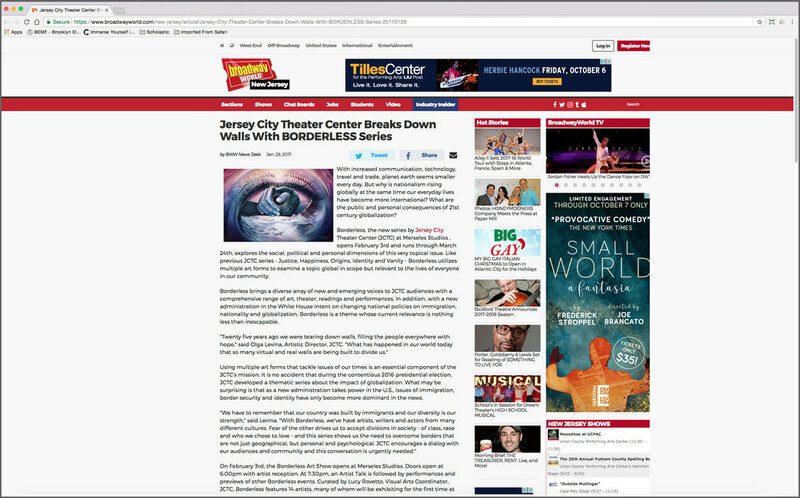 “Jersey City Theatre Center Breaks Down Walls With BORDERLESS Series.” January 29, 2017. Rod’s artwork, One Vision, was featured in the Broadway World – New Jersey article “Jersey City Theater Center Breaks Down Walls With BORDERLESS Series" in regard to the group exhibition at Merseles Studios Gallery. Jersey Indie. “Jersey City Theatre Center Breaks Down Walls With BORDERLESS Series.” By Schnee, Sonia. March 24, 2017. Rod’s artwork, One Vision, was featured in the Jersey Indie article, “Jersey City Theatre Center Breaks Down Walls With BORDERLESS Series” in regard to the group exhibition at Merseles Studios Gallery. New Jersey Isn’t Boring. “Jersey City Theatre Center Breaks Down Walls With BORDERLESS Series.” February 4, 2017. Rod’s artwork, One Vision, was published within the Arts & Culture section in the article, “Jersey City Theatre Center Breaks Down Walls With BORDERLESS Series” regarding the group exhibition at Merseles Studios Gallery. The Huffington Post. “Changing the Negotiating Game: 6 Tips for Smart Success.” By Sánchez, Raúl and Bullock, Dan. June 6, 2016. Rod’s artwork, One Vision, was published in The Huffington Post article, “Changing the Negotiating Game: 6 Tips for Smart Success” written by Raúl Sánchez & Dan Bullock. Making Music Magazine. Feature Interview. “Sanchez 2winz: Telling Stories with Art and Music.” By Cherie Yurco. Rod’s artwork, Winged Painter was published in the Making Music Magazine. The article was a feature artist profile interview with the duo Sanchez 2winz (Raúl & Rod Sanchez) about the ways they have been collaborating since birth, twin hood, creativity, live cinema, and storytelling through art & music. SonicBids. Feature Interview. “3 Creative Ways to Musically Collaborate With a Visual Artist.” By Shannon Lee. Rod’s artwork, Winged Painter was published in the SonicBids (Expert Music Career Advice for Musicians) article. The article was an artist profile interview with the duo Sanchez 2winz (Raúl & Rod Sanchez) regarding Artist Success Tips, Performing Strategies, & Audio/Visual Artistic Collaboration. Time Out New York Magazine – Full-Page Ad of Baruch College "College of Possibilities" Campaign Design. Rod Sánchez art directed & designed the Baruch College – Continuing & Professional Studies (Fall 2010 – Summer 2011) Campaign. The Paint Splash: "College of Possibilities" Campaign was featured in print & digital media such as: subway Ads, bulletin covers, online rich media ads, coffee sleeves, & magazine/newspaper ads (published in Time Out New York, The Village Voice, Metro New York, & AM New York). Time Out New York, The Village Voice, Metro New York, & AM New York). Create Magazine – Winners Showcase. October 23, 2008. Rod received two silver design awards which were published in the 2008 Nov. + Dec. issue of Create Magazine. These pieces were Rod’s illustration & design of the "Random House Children’s Books Fall 2008 Catalog Cover" and the sell-in brochure for the book: "Heck: Where the Bad Kids Go." NYS & CSEA Partnership Intermediate Spanish Curriculum. March 2007. Rod Sánchez’s ink Illustrations for the NYS & CSEA Partnership Intermediate Spanish Curriculum were published in 2007. His design of the fall 2009 T-shirt for the Continuing Education Association of New York Conference was also produced and distributed to all members. Rod Sánchez's artwork was published in the university literary/art magazine, Mosaic. Artwork published in the magazine included: "Ultrasound Goodbyes," "Numb on the Surface," "Disarm," "A Luring Luallaby," "Reconciled," & "Listening at a Train Station."